Impact damage may occur either at the manufacturing level or during in-service application of a material. Because impacts are the primary cause of delamination they must be detected at an early stage and the extent of damage characterised in order to evaluate the structural integrity of a structure. The difficulty to inspect heterogeneous materials with conventional non-destructive testing (NDT) methods is a well known fact. As new composite materials are being developed, these methods may behave differently and show limitations affecting their efficiency. Up to now, there has been very little work analysing the performance of NDT methods for the evaluation of thermoplastic toughened CFRP materials. The resistance to impact damage of a thermoplastic toughened CFRP material currently used in the manufacture of the Boeing 777 was evaluated non-destructively. Several [0/45/-45/90] 8-plies panels of thermoplastic toughened CFRP material were impacted with energies ranging from 2 to 14 Joules, and non-destructive characterisation of these samples was carried out using some of the most currently used NDT methods by industry. These include visual examination, ultrasonic C-scan, infrared thermography, radiography, shearogaphy and eddy currents. These NDT methods were used to quantitatively evaluate the resistance to impact damage of this new thermoplastic toughened CFRP material. In addition, a comparison of the efficiency of these methods to accurately detect and quantify impact damage in thermoplastic toughened CFRP material was made and the needs of industry for composites evaluation discussed. Thermoplastic toughened thermoset resin polymeric matrix composites offer improved resistance to impact damage compared to conventional carbon fibre reinforced plastics (CFRPs). However, this enhanced material may also present additional constraints in terms of defect detection and characterisation with conventional non-destructive testing (NDT) methods. Although ultrasonic testing was selected by industries as the major NDT method for composites evaluation, ultrasonic wave propagation is attenuated by this new material thus obstructing its non-destructive evaluation (NDE). Even more adequate methods such as shearography also need careful adjustment to test thermoplastic toughened thermoset resin polymeric matrix composites. The efficiency of six NDT techniques as been assessed in terms of impact damage detection and characterisation in [0/45/-45/90] 8-plies panels of thermoplastic toughened CFRP material. Thermoplastic toughened thermoset resin polymeric matrix composite panels manufactured by Toray Industries  were exposed to impacts of energies ranging from 2 to 14 Joules. Each panel has a dimension of 150.00 ( 150.00 ( 1.55 mm, a stacking sequence of [0/45/-45/90] and is made of 8 plies prepreg sheets. Impacts were generated using a computer controlled drop tower mechanism. Impact energy (J) was recorded as a function of time (ms) and load (N) as a function of time (ms) and defelection (m); such plots are shown on figure 1. Recorded plots of impact energy versus time, load versus time and deflection for a [0/45/-45/90] reinforced composite panel submitted to an impact of 6 Joules. Six of the most widely industrially used NDT methods have been applied to non-destructively assess the structural integrity of the impacted composite panels. Such studies allowed us to estimate the efficiency of these techniques in detecting impact damage in thermoplastic toughened thermoset resin polymeric matrix composites. At first, visual examination was carried out with naked eyes. Such examination is relatively common, rapid and can give a general assessment about the structural integrity of a material. However, it provides only information about surface damage and thus should be followed by a more sophisticated NDT technique for a more complete evaluation. If only one side of the structure is accessible, it is not possible to detect barely visible impacts which often generate a more important damage on the back surface of the material than on the impacted side. 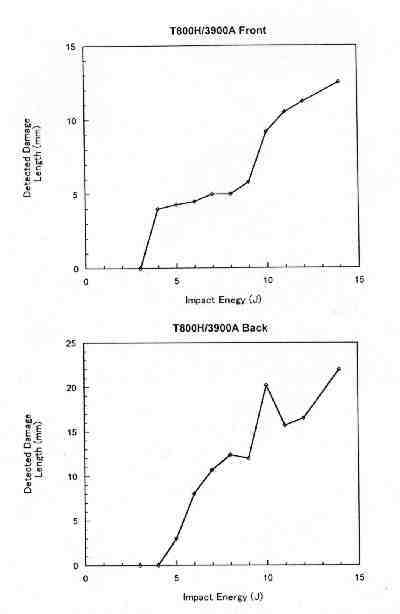 Figure 2 shows plots of the detected impact damage length against impact energy as detected by visual examination on the front and back surfaces of the specimens. Electromagnetic testing of CFRP materials is a low cost alternative that showed great potential for the detection and characterisation of low energy impact damage [2-3]. Eddy current testing is based on the principle of electromagnetic induction, which consists of bringing a coil carrying an alternating current to proximity of the material to be tested. This will have for effect to induce a magnetic field within the material. This magnetic field will generate currents known as eddy currents. A variation in the structural integrity of the material due to a flaw or a defect will affect both the eddy currents and the electromagnetic field. 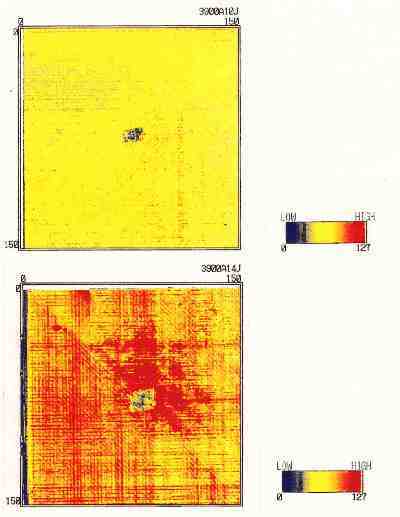 Analysis of these variations help in identifying faults in materials. 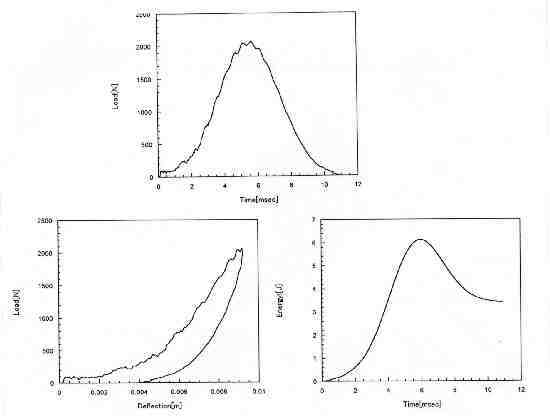 Results of eddy current testing of an impacted specimen is shown on figure 3. Ultrasonic inspection was carried out using a 25 MHz focused probe and an ultrasonic C-scan system designed by Krautkramer Japan. Ultrasonic C-scan results for impacts of 10 and 14 Joules are shown in figure 4. Inspection results are displayed as a colour coded map of the inspected surface, thus facilitating defect location. 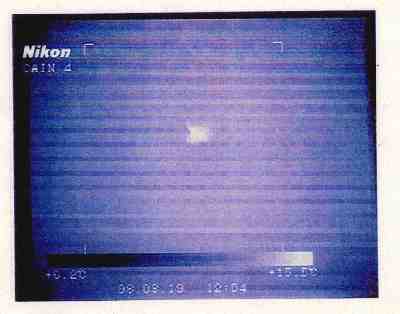 Infrared thermographic testing was performed using a Nikon Laird 3A camera and flash heating. 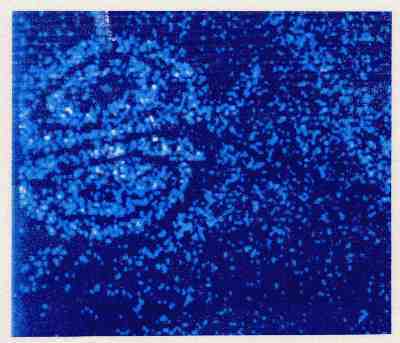 The infrared radiation emitted by the test samples were video recorded (figure 5). 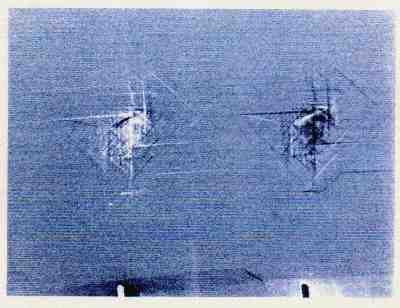 Although conventional X-ray radiography without dye penetrant can be of limited satisfaction for composites evaluation, an image subtraction real time radiographic system from the Japan Fine Ceramic Center (JFCC) allowed the detection of impact damage in this material (figure 6) . A 60 kV tungsten tube was used with an intensity of 0.13 mA at a distance of 180 mm from the object. The final NDT technique used was laser shearography, a non-contact technique based on the concept of optical holography [5-6]. The specimen tested is put under low strain generated either by heating or by vibrations, and a change in surface strain caused by the presence of a fault in the material can be detected by the shearographic camera. The inspection result (often showing as interference fringes on the surface of the material) is displayed in real-time on a TV monitor (figure 7). All the NDT techniques previously described and used present some advantages and limitations in terms of impact damage detection. Although most techniques are adapted for the detection of impact damage in CFRP materials, the inspection of thermoplastic toughened thermoset resin polymeric matrix panels presented additional restrictions which are discussed next. The naked eye visual examination offers a low cost rapid survey but is limited to the detection of impact damage of energy greater than 4 Joules. Quantification is difficult and varies greatly depending whether inspection is carried out on the front or back surface of the material. Indeed, for an equal impact energy of 14 Joules, the detected damage length was 76% greater on the back surface than on the front surface. Also, because impact damage on this material generates only limited visual damage, such examination can be very limited. Eddy current testing of CFRP materials is a low cost sensitive technique capable of providing both qualitative and quantitative impact damage information. However, this technique was difficult to apply using commercial equipment on this newly reinforced composite. Signal interpretation can be very straightforward by analysing an analogue signal display on the cathode ray tube of an oscilloscope, or in the form of a colour coded mapping of the surface tested. Only qualitative information was gathered, and for impact of low energies, it was difficult to estimate the degree of delamination. If carefully developed, it is thought that electromagnetic techniques present a low cost non-contact alternative to other more costly NDT methods. Ultrasonic C-scan examination is regularly used for the testing of composites and provides remarkable results for both on-site and during manufacture testing. However, it was noticed that ultrasonic waves were greatly attenuated by this new material. This may be due to the high toughness resin used in the manufacture of this material. Therefore, existing ultrasonic equipment would have to be adapted for an improved examination. Indeed, this wave attenuation may result in a partial quantification of the delaminated area. Infrared thermography was fast and non-contact and provided results in real-time in a colour coded format. However, damage caused by impacts of less than 8 Joules were not detectable. A limiting factor to be kept in mind for a technique which is considered as a rapid and efficient NDT method by industry. Additional research work is required, especially on the image processing side, to be able to detect low energy impact damage. The main advantage of this technique remains in the fact that direct colour images of the material inspected are generated. Although, such images may seem easy to interpret, in certain cases, image processing operations are necessary for proper thermograph interpretation. Without the use of dye penetrant, conventional real-time X-ray radiography is inadequate for the detection of impact damage in CFRPs. 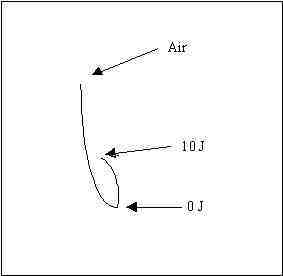 Nevertheless, the special technique from the JFCC allowed the detection of damage resulting from a 8 Joules impact. This is remarkable considering the low attenuating factor of this new material. Unfortunately, this laboratory equipment could be difficult to use for on-site testing and still present some radiation hazards. With the apparatus used, radiographs were displayed on a TV monitor, thus removing the photo processing phase often encountered with conventional film radiography. However, interpretation of the radiograph can sometimes be subjective and is limited by the resolution of the TV monitor used. Despite encountering minor difficulties (mainly due to the first time testing of this new material), the shearographic examination gave promising results. Among all the techniques used, it offers (together with naked eye visual examination) one of the best impact damage detection (see Table 1) and also gives a direct rough estimation of the damaged area. Here again, signal output is in a visual format (not analogue) and can be very straightforward for an experienced operator. As advanced composite materials are being developed, existing NDT techniques may face new challenges to efficiently detect and quantify impact damage. Judging by the rapid pace to which new advanced materials are being developed, it will become more and more necessary to adapt and modify existing NDT techniques to meet new requirements as well as to be able to efficiently detect and characterise damage in these new materials such as thermoplastic toughened thermoset resin polymeric matrix composites. The authors would like to thank M. Matsushima from the National Aerospace Laboratory for his help in ultrasonic testing. Toray Industries Inc. is also acknowledged for kindly supplying CFRP specimens. The advice of T. Sakagami from Osaka University for the infrared thermographic testing, and the help of Y. Ikeda from JFCC for radiographic testing are also acknowledged. H. Kishi and N. Odagiri, "Thermoplastic toughened thermoset resins for polymeric matrix composites", Composite Materials and Manufacturing Technologies Workshop, Canberra, Australia, (1997). X.E. Gros and K. Takahashi, "Eddy current monitoring of impact growth in composite materials", Proc. of the 9th Asia-Pacific Conf. on NDT, 135 (1998). Y. Ikeda, Y. Mizuta and H. Tobita, "X-ray image subtraction method for detection of small defects in ceramics", Proc. of the 8th Asia-Pacific Conf. on NDT, 349 (1995). J. Tyson, "Laser shearography for rapid nondestructive inspection", Materials World, 4, 521 (1996). M.-A. de Smet, "La shearographie - une solution ? ", Proc. of COFREND congress on NDT, (in French), 1, 391 (1997). X.E. Gros, "NDT Data Fusion", Arnold Pub., (1996), ISBN: 0340676485.